In very good condition and very nicely marked Schambach & CO Berlin 1942. 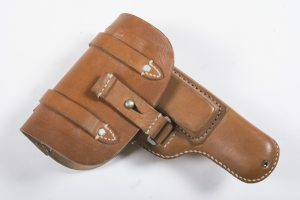 These holsters where intended for a range of 7,65mm pistols such as the PPK and HSC. 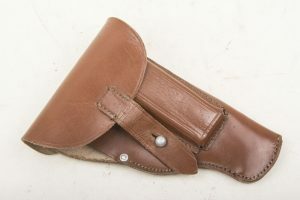 A nice mint holster! Nice near mint late war Zeltbahn with nice strong colours. Most if not all of its originally sewn buttons and nicely marked R.B.Nr. 0/0156/0018. Incredibly scarce pre war Heer breadbag with leather pouch for maps and pencils. 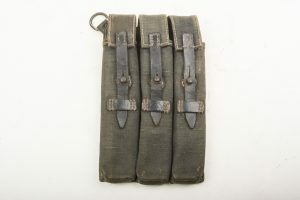 This pre war breadbag designed for NCO’s and Officers was meant to be worn in the field without having to have both a mapcase and a breadbag. These where only produced and issued for a very short time just prior to the 1939 campaigns. The breadbag is complete with its original strap. There are two missing buttons and one piece with faulty stitching. This is only the second breadbag of this type I have ever seen and the first one I’ve seen for sale. A must have for the equipment collector! Rare brown pattern Splittertarn Zeltbahn. These Zeltbahnswith brown colours where only made for a short period, probably for a trial run. It retains most if not all of its originally sewn buttons and all three ropes. Otherwise it is in near mint condition with nice strong colours! These brown pattern Splittertarn Zeltbahns are hard to find and this one is the best one we’ve ever acquired! Nice late war Ersatz Y-strap made from light grey webbing. 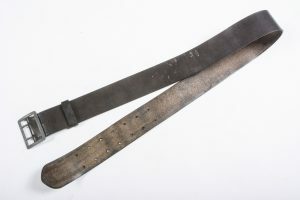 This late war Y-strap is in good used condition and is made utilizing British buckles as seen on the Litzmannstadt type Y-straps. 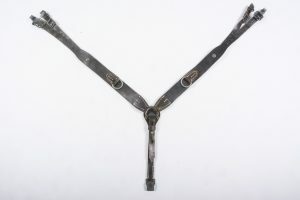 The Y-strap is in good used condition and would be a nice addition to any equipment collector! Exceptional pre war Polish WZ31 helmet in near perfect condition. The helmet retains up to 95% of its original grainy Salamandra finish on top of the magnetic shell. The helmet retains all three of its liner pads. The helmet retains its original chinstrap which has a small repair. The crown of the helmet has a ink stamp LUDWIKOW. 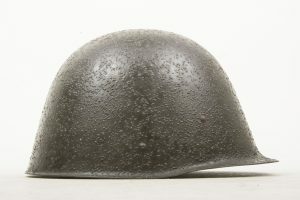 The helmet is a near perfect example of a pre war Polish WZ31 helmet that are very, very ,very rare! Textbook M40 Heer trousers in wool. All of the nap is remaining to the wool, all buttons are present and originally sewn. I can not find any moth or insect damage to these trousers. These would be perfect for a mannequin as they are in a good size. Hard to find textbook issue M40 trousers in perfect condition! Perfect pre war M31 messkit marked SMM35 indicating production by Süddeutsche Metallwarenfabrik, Mussbach in 1935. The messkit retains its original factory paint up to 98% and would be near impossible to upgrade. Very hard to find such a early messkit! 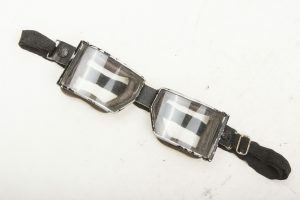 A very nice pair of pre war goggles as issued to motorcyclists in the Wehrmacht and Waffen-SS. The goggles are with a nice set of lenses without cracks. The strap has lost most of its elastic but can easily be displayed on a small sized helmet without falling down. These goggles are the finishing touch to a early war Kradmelder mannequin. 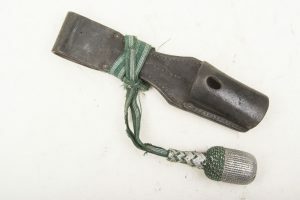 A mint bayonet marked ab44 indicating production by Mundlos AG, Magdeburg. The bayonet has never been sharpened or reblued. The bayonet is matching to its phosphatised scabbard with the serial 9438 and has nice red bakelite grips. The bayonet is in really good, near mint condition! 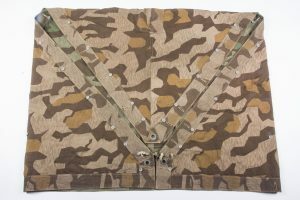 A late war Heer Splittertarn 4-panel zeltbahn in good used condition. The Zeltbahn is nicely marked RB-Nr. 0/0769/0023 and has most if not all of its originally sewn green(!) steel buttons. There is one nicely done period repair on the main panel. This is a rare, late war Zeltbahn with green(!) steel buttons! 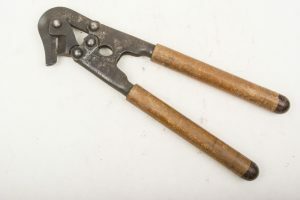 Very nice pre war isolated wire cutters marked Gebruder Heller 1935. This is the earliest one I’ve seen so far, very hard to upgrade. 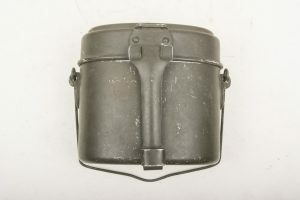 A original M42 rough camouflage helmet in good used condition. The helmet is marked EF64 indicating production by Emaillierwerke Fulda. 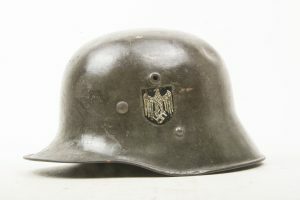 This helmet was found in a houseclearing in Germany recently and hasn’t been in a collection before. It is in uncleaned condition and features a nice brush applied rough camouflage paint. The original paint remains up to 95% and the helmet is complete with its original liner and privately made chinstrap that have never been removed. 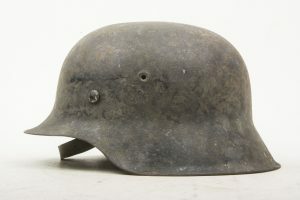 A simple but stunning untouched helmet used in the last days of the war. Nice original bayonet frog dated 1941 with Troddel. 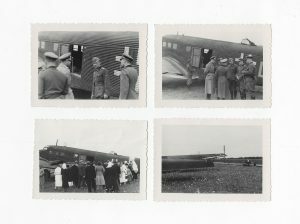 A nice set of four original Waffen-SS pictures depicting officers standing next to a Junkers Ju 52. Reissued M16 double decal Heer helmet in used condition. The helmet retains both of its originally applied decals and liner. The helmet is a nice example in a deep apple green colour with 85% of its original finish remaining. The helmet is a desirable size 66 shell with a size 57 liner. The helmet has a number of external dents on the crown indicating a lot of use. The helmet is a nice and typical example of a reissued Austrian helmet! 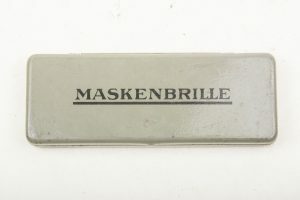 A nice pre war pattern Maskenbrille complete and named to Waffenmeister Spritz. 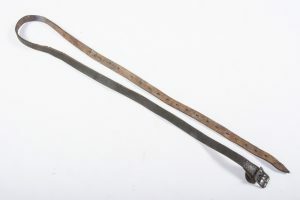 Rare leather A-frame strap in good used and supple condition. Hard to find spare for any A-frame! 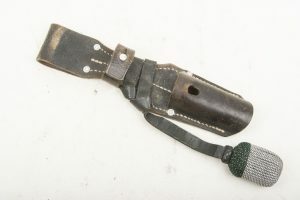 A nice and original black leather bayonet frog marked Stecher Freiberg 1940. The bayonet frog comes complete with its originally mounted Troddel and would be ready for a nice early matching bayonet. 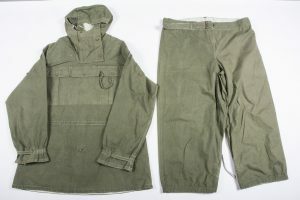 A very nice and minty late war Gebirgsjäger anorak set consisting of a Windbluse and Windhose. 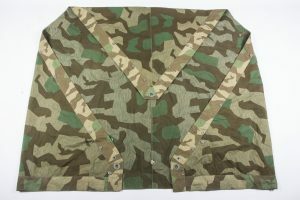 These reversible camouflage garments are waterproofed and meant for the Ski- und Gebirgsjäger. 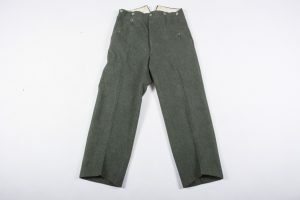 These garments are hard to find in good condition, especially the trousers. The jacket has has a few neatly and period done reinforcements on some seams but is otherwise in unissued condition. I’ve added some pictures of these garments in wear. The garment is in a very nice and large size fitting all mannequins. A nice complete uniform in a nice mannequin size that would instantly dress a combat display! 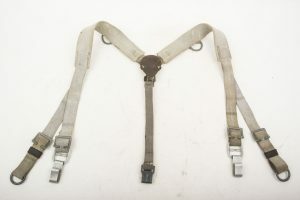 A very rare Gebirgsjäger rucksack waist strap in good used condition. 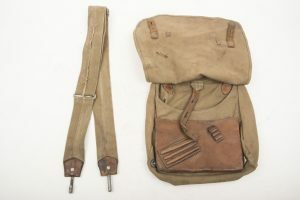 This piece is virtually always missing from all Gebirgsjäger rucksacks and impossible to find as a spare! 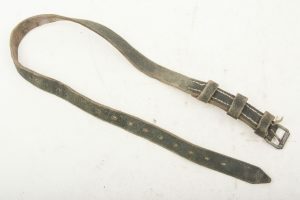 Mint late war Hidden-stitch Y-strap marked RB-Nr. 0/0344/0023. 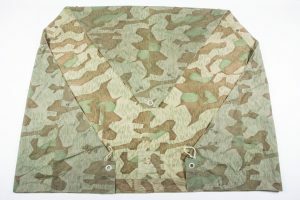 Scarce to find late war with the typical late war simplified back strap but with the early hidden stitches on the front. Unique model! A very nice original MP38 and MP40 magazine filling tool, nice piece to fill a left MP40 pouch with or for using! 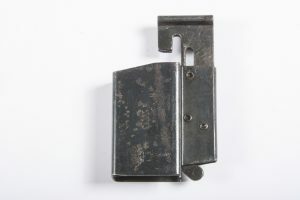 Scarce mint Lightbrown Luftwaffe 37M pistol holster marked cdc 42 indicating production by Kern Klager & Co. Lederwaren, Berlin. Impossible to upgrade mint holster! 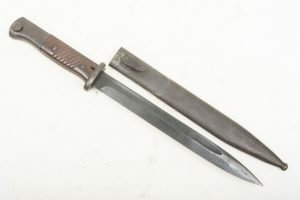 A very nice 1940 dated bayonet. Nicely marked E.u.F. Hörster and dated 1940. 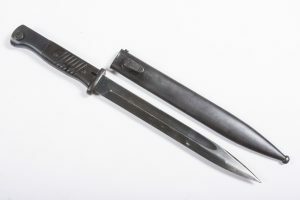 The bayonet is matching and with most of its original blueing. Hard to upgrade 1940 dated matching bayonet! Hard to upgrade matching bayonet marked Jos Corts 1938 indicating production by Josua Corts Sohn, Remscheid. The bayonet is matching to its scabbard with the serial 519 and has nice clean bakelite grips. Jos. Corts marked bayonets are one of the rarest K98 bayonets! The bayonet is in very good, uncleaned, unsharpened and matching (!) condition. A rare 1917 dated K98A deactivated to the newest EU specs – no moving parts. This late ww1 rifle was one of the first carbines issued to the Imperial army. It was designed and issued to Kavelerie and Stosstruppen. 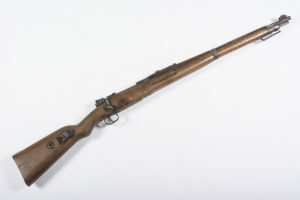 The rifle found more use in the Reichswehr and early parts of world war two. 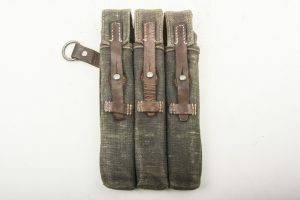 The carbine comes with a ww2 era sling in supple condition. The rifle is not fully matching but complete. A rare carbine which would make a great Imperial, Reichswehr or early world war two display! Shipping within the EU is possible at your own risk and responsibility after age check – PICKUP IS PREFERRED.